For people with some extra cash who want to improve their TV experience with only one product, the PLAYBASE is great. And you have the option of hooking it up to a Sonos system eventually. Just don't expect it to get amazingly loud or even provide you with surround sound on its own. So it’s been some time since we’ve had a new Sonos product to play around with. Five years to be exact. But they recently announced the new PLAYBASE and we’ve been testing it out over the past week or two. So is it the next best thing from Sonos? And should you invest your money in it? The unboxing experience makes you feel like you’re opening a top secret briefcase. You have to literally unlock the box via two switches on either side before you can lift off the top piece. It’s actually kind of dope. Once the lid is off you’ll get the PLAYBASE which is wrapped in a soft fabric and standing upright. Take it out and you’ll get the speaker along with a power cable, optical cable, Ethernet cable, and some instructions and notes from the team at Sonos. It shouldn’t be surprising, but the PLAYBASE is kind of beautiful. Well, as beautiful as a big box can be. There’s nothing on it save for a small button on the side, three small touch sensitive controls on the front, and three inputs on the back for getting started. That’s it. Along the front you’ll see a small Sonos logo with an LED light that flashes different colors to let you know whether it’s on, off, pairing, or having a hard time connecting. All this is found right in the front on top of the grill which houses all of the driver. The grill extends around the front and halfway down the side before stopping and turning into smooth plastic like the rest of the base. As the name implies, this is a sound base so it goes underneath your TV. If you have your TV mounted to the wall then you obviously don’t have to worry about anything, but it’s worth mentioning that if you plan on standing your TV on top of the PLAYBASE it can only support a weight of 77 pounds. That’s more than enough for most TV’s but still something to keep in mind if you have a larger one. It also doesn’t seem to scratch too easily which is good. Sliding my TV around the top of it revealed no scratches, only easy to clean smudges. The most important features of a Sonos product aren’t usually the design, it’s the sound quality and connection. On the back you’ll find a power input, ethernet cable input, and optical input, and that’s it. I had no problem connecting it to my PS4 (which is all I use my TV for), but if your TV doesn’t have an optical input you might have to look into some converters for a workaround. The setup process is fairly easy as the Sonos app is extremely intuitive and walks you through it step by step. I only had one major issue with setup. While following the app you’re asked to go through a series of simple steps and then finally, it asks you to connect to your internet modem in order to connect to Wi-Fi. I had assumed it was able to search for available internet without being hardwired in. Not a huge deal, but it would’ve been nice to know this before I set it up and put a huge TV on top of it. This isn’t a big deal if your setup is near your modem or even if Sonos had included a really long ethernet cable to reach your modem, but the included cable is painfully short and I ended up having to undo the entire setup to go plug in to my modem. Once you’re all set up, using it is super simple. I didn’t think I would like the Sonos app very much, but it’s top notch. It’s easy to switch between TV mode and music mode, and you can log into basically any music streaming service for all of your music and playlists in a minimal, easy to navigate UI. 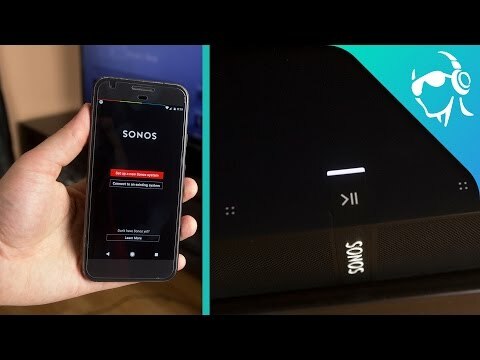 If you decide to fill out your Sonos ecosystem in the house, adding new speakers and grouping them together is also super simple thanks to the app. Whether you’re listening to music, watching movies, or playing games (which I did a lot of with this), the PLAYBASE does it all and does it well. Lows were strong enough to make explosions rumble and music bump. The rolling bass in the song “No Church In The Wild” by Jay-Z and Kanye West sounded great with plenty of controlled power. When I switched over to play some “Horizon Zero Dawn” on my PS4, lows were just as impressive. I’ve been playing this game for a month and I feel like I’m just now able to appreciate the complexity in its score. Granted, anything is better than the stock speakers built into the TV, but what I’m trying to say is that the PlayBase handles lows extremely well. Mids were fine when it came to music, but where they really made their mark on me was while watching TV shows and movies. Soft dialogue was just as audible as loud yells and I didn’t have to keep adjusting the volume depending on what was happening in the film. It stayed very consistent throughout the movie. Highs on the PLAYBASE were also great. Cymbals and hi-hats had plenty of shimmer and never became harsh even on max volume. My one complaint is that the PLAYBASE doesn’t get all that loud and also doesn’t have an amazing soundstage. It’s good, but not great which makes sense since Sonos conveniently sells all the pieces to turn your living room into a home theater. If you can’t already tell, I love the PLAYBASE and whether it’s your first piece of Sonos equipment or your fifth I’m sure you will too. Anything that you play on your TV can be played on it, the app is easy to use and has plenty of functionality, and most importantly it sounds great. Unfortunately, all this comes at a crazy steep price tag of $699 which is way more than my TV costs. Not to mention they already sell the PLAYBAR at that same price point. So then who is the PLAYBASE for? I feel like the PLAYBASE is best for people who just want great sound out of their TV and don’t want to go crazy buying multiple speakers and setting them up around your living room. This can’t give you surround sound so you’ll have to buy a few more Sonos speakers for that, and it also doesn’t support some of the newer things home audio geeks might be excited for like DTS so it isn’t exactly future proof. But again, it’s an instant upgrade to your TV speakers. The PLAYBASE is for the average person who might not be interested in an entire ecosystem of speakers and just wants one thing that will greatly improve the way you experience movies. Now if you’re not looking to spend $699, we do have a list of the best budget soundbars you can get so you can check that out. But if you do decide to spend the money and get the PLAYBASE you won’t be disappointed because as we mentioned, it does sound pretty damn great.